One of the best things about writing a food blog is that you not only get to play with food, but you also get to review cookbooks… and given my obsession with them this is a good thing!! Recently, Quirk Books sent me a copy of “Little Old Lady Recipes – Comfort Food and Kitchen Table Wisdom” by Meg Favreau. This cookbook is a collection of recipes by real life home cooks – an homage to the “extraordinary women who create potluck dinners, church socials, and the best desserts you’ve ever tasted”. It covers everything from basic oatmeal to.. gimlets (but more on that, later). Each recipe is accompanied by a photograph of the cook (instead of the dish) and more often than not a “pearl of wisdom”. Like all cookbooks in my stack, I read this one cover to cover.. and I loved every page. The recipes, the photos and the quotes … it truly is a snapshot of American cooking that is often overlooked and a wonderful way to “re ground” your approach to food and cooking. Ok, so back to the gimlets. The recipe in Little Old Lady Recipes is the classic recipe with gin and Rose’s lime juice. But as usual, I can’t go with the stated recipe and have to “tinker” – especially since I didn’t have any Rose’s Lime Juice. Sitting on my kitchen counter was a huge bowl of tangerines and I thought… why not? Why not, indeed.. it was delicious and while not strictly a gimlet, I think the “little old ladies” would approve! 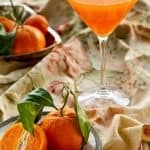 A slightly sweet twist on the classic gimlet, this tangerine gimlet makes the most of winter citrus! Fill a shaker with ice. Add the vodka, tangerine juice and simple syrup. Shake to combine the ingredients. Strain into a martini glass. Apart from the fact that I cannot drink vodka, this drink looks superb! Hi Zee!! You could use gin or do a non alcoholic version with a little sparking water – had leftover juice and simple syrup and added some sparking water and it was good!! I’d like to think so too!! The quote from Gladys made me seriously laugh out loud; now that’s the spirit! And while not exactly a gimlet…who cares. Tinker is what we do or this wouldn’t be fun. I’m working on something similar for tomorrow. Think grapefruit! Oooh… grapefruit!!! I’ve been a bit obsessed with them lately so I can’t wait for this cocktail! The quotes in this book are hysterical… and most of them true!! Definitely more sophisticated than a screwdriver! Love the colors! Looks like someone has mastered the art of “tinker”-ing … love the twist on this classic Nancy! Thanks Josie!! Have to be careful with the “tinkering” though… :-)!! Wow this sounds fantastic!! And what a great photo too! Thanks Jenn! I had fun with it – a little departure from my “usual” – one of the goals for 2012 is to stretch my photography!! So simple but perfect! Making one tonight. I will do as Gladys did the next time I’m offered help. That is the right attitude:)This looks refreshing. The book sounds very interesting. Me too Lora!!! The book is really cute and funny! Great photo Nancy. I love the bright tangerine lighting up the martini glass. The cookbook sounds great too. Will have to check it out. Aww… thanks! The book is really fun – the quotes are a riot!! I was told that orange is a really difficult color to photograph, but that does not seem to be the case here. Lovely photo. Thank you!! I shot this rather late in the day so had to work on the lighting a bit, but it all worked out ok – I then of course rewarded myself with the cocktail! Have to love those “fringe” benefits! I LOVE ““If you are working in the kitchen and someone asks if you want help, immediately remove your apron, hand it to them, and go into the living room to have a drink..”. I’ve got to get this book, it conjures up a sort of 50’s image where ‘girl’s night out’ meant bridge, finger foods and well, gimlets! That tangerine gimlet looks spectacular. so simple and refreshing..love tangerine! Hi Lisa! The book is truly a hoot… I love that the author photographed the cooks and not the dishes!! Love that this is a Little Old Lady recipe! 🙂 What a lovely idea–and a gorgeous photo. TGIF! Hi Amber! I think you would get a kick out of this book – the quotes alone are worth having! So glad you liked the photo! OMG that quote is a gem and one I will definitely use! The cookbook sounds really great! And yum this drink must be fabulous with tangerine juice! Thanks Jamie! This book is absolutely hilarious! The recipes are, as you would expect, very basic and “American” but to me it is such a “picture” of American cooks (both literally and figuratively) that it is worth reading! So glad you liked the gimlet!!! 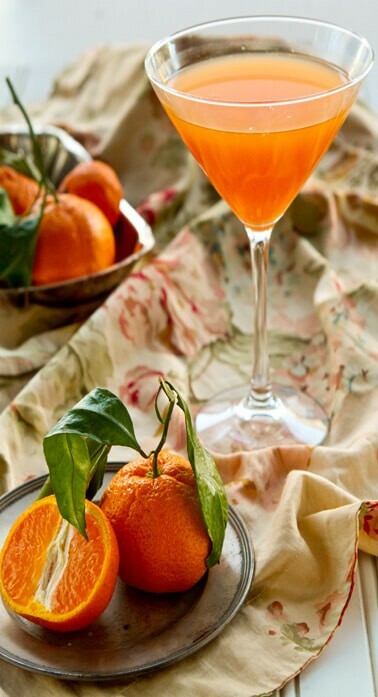 I’m definitely with you – I love citrus based cocktails too – so refreshing! Mmm! A few of my favorite things! I have vodka and tangerines ….. Going to try one tonight! Hi Patricia! I hope you enjoy it!! Anything with vodka has to be delicious. A must try, for sure! It definitely “does” go with everything! I’ve been enjoying Cucumber Gimlets recently. This sounds like a delicious variation though! Oooh… now that I HAVE to try!!! I love the use of tangerines, here! So pretty. What is the difference between a martini and a gimlet? By the way, last night I made basically the same drink (before reading your blog). =) Instead of using plain simple syrup, I used lemon verbena simple syrup. It was delightful.